Hello! I am seeking a new trendy, stylish bag- I have a Tod's black shoulder hobo, a Fendi little bag, and a few other bags here and there, but nothing that i want to or can use every single day. I like to carry a lot of 'stuff' in my purse too!!! I was thinking in the $300-500 range, but am not super picky, just really want some direction as far as use and trend! Well, Alicia, you're in luck because finding a stylish, trendy (but not TOO trendy! ), roomy, well-made and moderately priced designer "everyday" bag is not that difficult a task any longer. I have the perfect designer in mind for you - Marc Jacobs. His MARC by Marc Jacobs line is filled with designs that will satisfy all your requirements. E-tailers such as eLUXURY, Saks, Neiman Marcus, Nordstrom and Shopbop carry a wide selection of the MARC by Marc Jacobs handbag line. You can search these sites at your leisure, but I would be happy to suggest one bag in particular which photos do not do justice.The Totally Turnlock Quinn Shoulder Bag is my personal favorite (as well as my Christmas present from hubby!). This extremely well-appointed design must be viewed in person to appreciate. It can hold its own against more expensive designer bags. The comfortable dual top handles fit comfortably over the shoulder, and the fold-over flap top with signature turnlock closure is trendy without screaming "fashion victim". It's very roomy and will fit everything you need for a full day on-the-go. I even manage to fit a couple of small books and a water bottle inside. I've left the best part of the Quinn for last - the leather. This bag begs to be touched. The leather is supple and flexible. You'll love this bag because it's stylish, trendy yet very practical and not over the top. 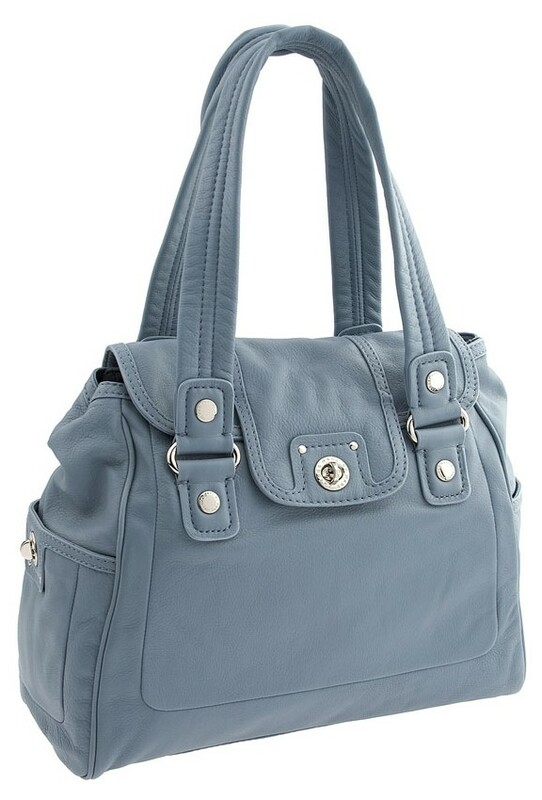 Plus, at $468, the Totally Turnlock Quinn Shoulder Bag is a bargain. It's available in several colors (I have the cream version), so you can be as bold or as safe as you'd like. If you don't like this bag, Alicia, I'm sure you'll find what you're searching for among the many other fabulous MARC by Marc Jacobs bags.